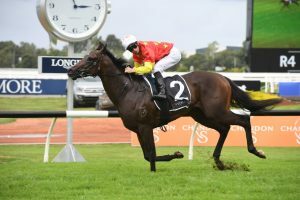 Peter & Paul Snowden trained two-year-old Cosmic Force stole the show at Rosehill on Saturday claiming the Group 3 Pago Pago Stakes (1200m) in impressive fashion. In the final lead up race ahead of next week’s $3.5 million Group 1 Golden Slipper (1200m), the colt by Deep Field raced away on the wet track to win by over seven-lengths. Not surprisingly, the win has seen Cosmic Force firm from a whopping $51.00 into $7.00 with Ladbrokes ahead of the Slipper. Things didn’t look easy at the final turn, but Cosmic Force’s explosive turn of foot saw him race away from the tightly bunched field to storm home in a time of 1:12.93 – a full second quicker than the fillies. Cosmic Force, above, has firmed onto the first line of betting ahead of next week’s Golden Slipper at Rosehill. Photo Credit: Steve Hart. “He is a very tough animal. He still didn’t get the right run today, he worked in the run, and you’ve seen what he did” Snowden said after the race. Snowden now heads to the Slipper to challenge newfound rival Micrphone, who won the Group 2 Skyline Stakes (1200m) over Cosmic Force at Randwick earlier this month. Microphone is one of many Godolphin chances ahead of the race, but Snowden thinks Cosmic Force has developed into a sturdy swimmer – good news ahead of what could be another wet Rosehill track next week. “Today we took our time coming across. It didn’t pan out the way we thought, three deep no cover is not ideal,” Snowden said when asked on Cosmic Force’s second-placing to Microphone. Winning jockey James McDonald was also elated with the win, going as far as asking if he could swap horses after accepting to ride Tenley, who is the $6.50 second-elect, next weekend. “Can I swap rides?” McDonald joked after the race. Cosmic Force now hopes to become the fourth horse to win the Pago Pago-Golden Slipper double, with Stratum being the most recent to do so in 2005.